In the aftermath of the Parkland shooting, in which 14 students and 3 faculty members of Stoneman Douglas High School lost their lives to bullets fired from a mentally unstable 19 year-old’s AR-15, most of us are asking the obvious question: “How do we prevent something like this from happening again?” I do not claim to know the answer. But it seems to me that all reasonable ideas should be on the table, from renewing the assault weapons ban, to universal background checks, to closing the so-called “gun show loophole,” to increasing our collective investment in mental health diagnosis and treatment, to more comprehensive data integration. While I personally do not believe arming our teachers or other faculty members is part of the solution, that too should be part of the debate. What should be off limits, however, is unreasonable rhetoric. Let me be clear: by “off limits” I do not mean such speech should in any way be shut down. To the contrary, it should be called out for what it is. And no one is more adept at employing such rhetoric than the National Rifle Association. It does so following each and every mass shooting. This time around, speaking to the Conservative Political Action Conference, the NRA’s executive director Wayne LaPierre warned of a socialist takeover of Congress that could lead to the loss of many of our freedoms, but “first to go will be the Second Amendment.” This is not the first time I have encountered that line of argument, from that very man. Following the December 2012 mass shooting at Sandy Hook Elementary School in Newtown, I received a letter from Mr. LaPierre inviting me to become a member of the NRA. I offer my response now to call out publicly what I only privately condemned five years ago and to add a more thorough analysis of our Supreme Court’s 2008 decision in District of Columbia v. Heller to the national debate on this important issue. Thank you for your invitation to join the National Rifle Association. Unfortunately, I must decline. The reason is simple. But before I give it, allow me to address several points you raise in your invitation letter. First, after asserting that the re-election of President Barack Obama marks “the beginning of a four-year nightmare,” you state: “You know as well as I do that our freedoms are in far greater danger of being dismantled and destroyed than they were four years ago―not just our Second Amendment rights but all the freedoms enshrined in our Constitution.” No, I do not. But since you do not mention which other freedoms you believe are in danger, I will confine my response to the Second Amendment. Thus, the United States Supreme Court has held “the right secured by the Second Amendment is not . . . a right to keep and carry any weapon whatsoever in any manner whatsoever and for whatever purpose.” (Heller, supra, 554 U.S. at p. 626.) Instead, it is the right to possess and carry weapons “typically possessed by law-abiding citizens for lawful purposes.” (Id. at p. 625.) It protects the right to possess a handgun in one’s home because handguns are a “class of ‘arms’ that is overwhelming chosen by American society” for the lawful purpose of self-defense. (Id. at p. 628.) It does not protect the right to possess a machinegun or a short-barreled shotgun. Nor do I believe that it protects the right to possess the assault rifles that have become the preferred weapon for use in mass shootings. 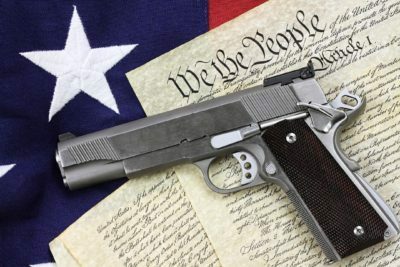 Reasonable minds can disagree on where the line should be drawn between guns which are or are not typically possessed by law-abiding citizens for lawful purposes. You believe assault rifles are covered. I do not. Third, you claim that “elitist, arrogant politicians like New York City Mayor Michael Bloomberg” are “working day and night to outlaw [our] right to self-defense.” I know of no such work. Nor would it be successful. As mentioned, under Heller, supra, 554 U.S. 570, banning the in-home possession of firearms that are typically possessed by law-abiding citizens for lawful purposes such as self-defense would violate the Second Amendment. (Id. at p. 635.) President Obama has even stated that the Second Amendment “does provide for Americans the right to bear arms for their protection, for their safety, for hunting, for a wide range of uses.” (http://www.whitehouse.gov/the-press-office/2011/03/03/remarks-president-obama-and-president-calder-n-mexico-joint-press-confer [as of Jan. 10, 2013].) No one is trying to outlaw self-defense. I decline to become a member of the National Rifle Association not because I am opposed to guns. Like most men, I like guns. I also believe in self-defense. And if it were simply that we disagreed about whether or not the Second Amendment covered assault weapons, I still might join. I decline because your rhetoric is unreasonable. Now is the time to have a reasonable debate about gun control in America. Your press conference following the massacre in Newtown and your invitation letter to me have demonstrated quite clearly that you are not willing to participate in that debate. Please remove me from your mailing list. Nicholas Mahr is a California attorney. The views expressed herein are his own and do not reflect the views of his employer or any other person or entity.